When I watch a movie on my PC, my processor (I5 2500k) is decoding video, not a video card. When I watch youtube, all the same. And when video quality 4k 60 my processor, allready is 100% loaded. But my new video card didnt decoding video. How to make a video card decode video? In CyberLink PowerDVD 17 hardware acceleration is enabled, but the effect is the same. video is processed only by the processor. video card not used. Try updating the RX 580 AMD Driver from here: Radeon™ RX 580 Drivers & Support | AMD . From what I have read encoding and decoding video is mainly done by the CPU with help from the GPU. It might be the Video Player or Codec misconfiguration that you have installed that may be causing the problem. I too use PowerDVD 17 on my computer. 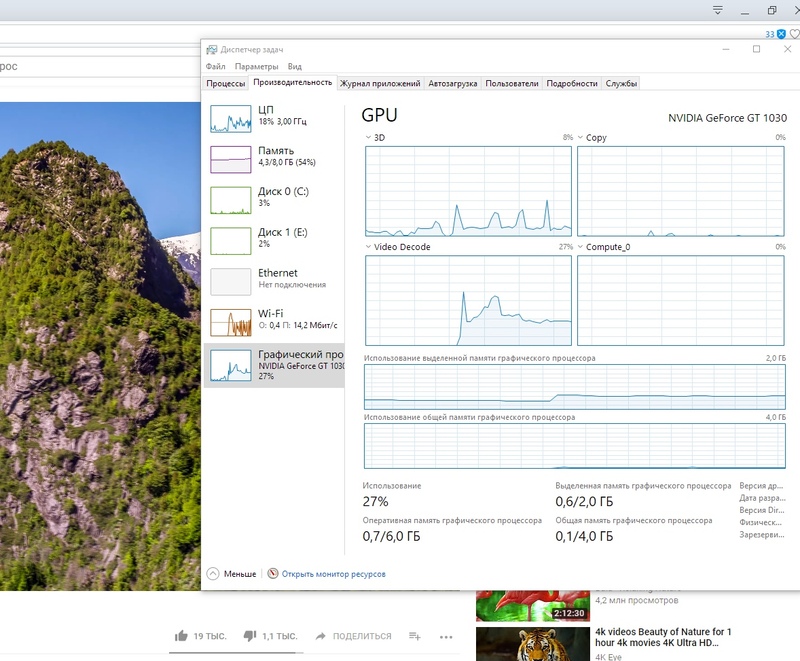 Just now I was playing a Blu-ray video file and it showed my GPU decoding around 12% and while watching Youtube video my GPU was decoding around 4%. The CPU usage is very high during video playback, any tips on how I can lower it? Video playback can require a lot of processing power, certainly when the video has a high resolution (720p/1080p/1080i). Some video formats, such as H.264 and HEVC, are very complex to decode. Use a hardware accelerated decoder. Options for hardware acceleration are shown during installation of the codec pack when your system is compatible. A hardware accelerated decoder offloads the video decoding to your graphics card (GPU), significantly reducing the workload of your CPU. Your graphics card needs to support this functionality, but practically every graphics card manufactured in the past few years supports it for at least certain video formats, such as H.264. Disable the "Allow animation when buffering" option in the DirectVobSub subtitle filter. That lowers CPU usage a bit. Animated subtitles (such as found in some anime videos) may not display correctly with this option disabled, but such subtitles are rare. The same option can also be found in Media Player Classic for its internal subtitle renderer. Use the Overlay Mixer renderer. This video renderer uses a bit less CPU cycles than other renderers. Recommended only on Windows XP. 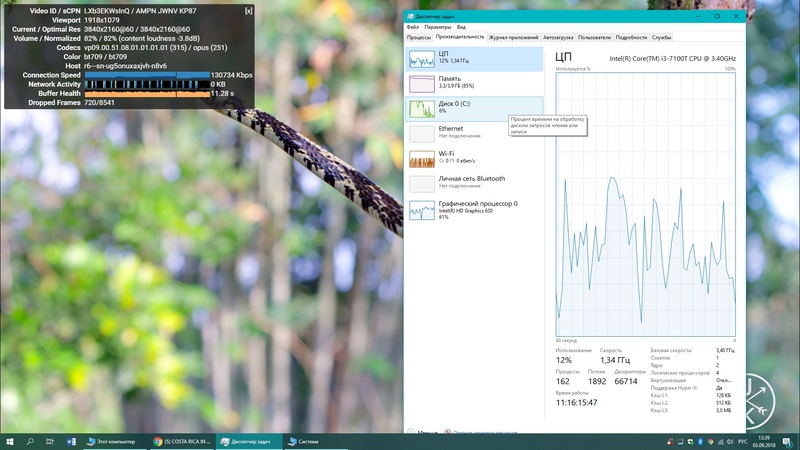 Close other programs that are also running on your computer that use a lot of CPU cycles. For example BitTorrent and other P2P programs. Try installing VLC Player (Download official VLC media player for Windows - VideoLAN ). It is free and see if your GPU card is being used to encode or decode while watching a video. VLC Player plays just about any type of Video files. If it does use your GPU card than the problem is with PowerDVD 17 or Codecs you have installed not being configured correctly. But first make sure you have the latest driver for your GPU card and see if that helps. If not then use a different Video Player and see if the GPU card is being used to encode or decode video. Ok I will do that. There are many freely available online tools that you can use to translate from russian to english. Why I need to post on English? You can translate too. even by your phone. I didnt saw the problem with different languages. This isn't my rule, it is AMD Forum's rule. This just happens to be an English Only Forum. What I posted was copied from AMD Forum Rules and the person who made the rule is one of AMD Forum's Moderators who runs this forum. True, I translated your Post into English using my Chrome browser. The same way you can translate your Post into English to post here. I realize there may be some misunderstanding or difficulties in translating what you want to say from Russian to English. But Users here will probably understand and try to help you with your problem. Also for Users to help you troubleshoot your problem you must post your computer information as required by AMD Forum. Windows version installed, Make & Model of CPU/APU, GPU, PSU, RAM MEMORY, & Motherboard, or exact Make & Model of your Laptop if it isn't a Desktop computer. Current Graphics Driver installed. Etc. So what you are saying that the internal Graphic (Intel HD 3000) of your Intel APU is doing all the work while the RX 580 is idle. In BIOS, Do you have your RX 580 as Primary Graphics card or Integrated Graphics as primary? Do you have your cables connected to the Motherboard's Video Outputs or the RX 580 Video Outputs? Does your RX 580 show up in Device Manager and does it have any errors indicating like a Yellow Exclamation mark or error code? Do you have a laptop or Desktop? Here is the latest Desktop AMD Driver for the RX 580: Radeon™ RX 580 Drivers & Support | AMD . The only Windows AMD supports with drivers for the RX 580 is Windows 7 & 10. I do not have a video output on the motherboard. the video card works correctly, all the games work fine. Need to post more information on your computer setup . Is this a Laptop or Desktop? You Intel CPU has integrated HD 3000 on it. If this is a Desktop what is the Make & Model of your Motherboard? Can you clarify what you mean by "Video Decoding" ? In your browser under settings turn off " Hardware Acceleration" and see if your video plays normally. when I watch the video, my video card must decoding this video. Video card decoding this video, not a processor. Video decod on graphics you can see 27% thats my friends graphics, he have the same processor, but different mother board. WOW WOW WOW new info from me! Great that means the problem is somehow related to PowerDVD 17. I would contact Cyberlink Support and open a ticket and find out why PowerDVD 17 is not utilizing the GPU card in encoding or decoding videos. Video is decoding by Video card! check to see if your browser has "Hardware Accelerated" clicked in settings. If it isn't activated, click on the box to activate it and see if it makes a difference. Im allready did it before, no effect on youtube. On vimeo decoding is working!!! And you know, yesterday I allready try use a SPLASH player. but its dosent workd. But 1 hour ago Im update videodrivers, now its good. now I will not use power dvd. What browser are you using to watch youtube? owerDVD 17 Consider Upgrade! The Latest Version is Just Announced! just for troubleshooting purposes, try running Youtube video in normal HD format rather then UHD format (Non-4K) and see if your GPU is being used to decode. Now I will ask YouTube Support. Now I think I closed this topic.